Looks like the Mid-Century Modern Furniture is here to stay for long. And why not? Their timeless understated look, minimal fuss and practicality gel well with a variety of home decor. For instance, you can add a mid-century modern coffee table in a contemporary or a minimalist setting and add character to the setup. So how you can play around with mid-century design is really, all up to you. Here’s our hand-picked selection of the 10 best mid-century modern coffee tables for some design inspiration. This coffee table made of Indian Sheesham wood is a solid example of a modern take on mid-century design. It possesses the characteristic sleek silhouette and clean lines. It has an open shelf on one side and a geometric two-tone grey and yellow drawer on the other. 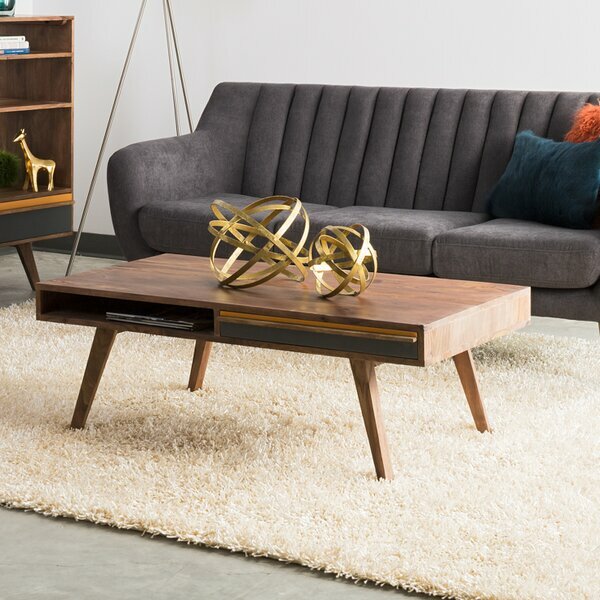 You can pair this coffee table with a mid-century modern accent chair to complete the vibe. Buy this Now. 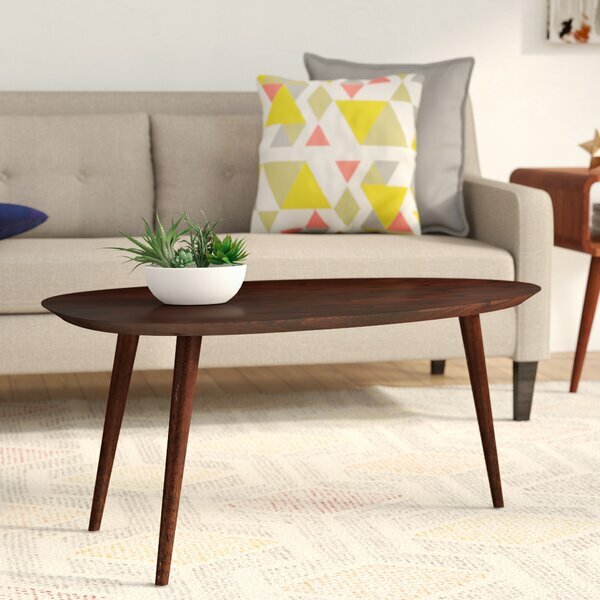 This functional mid-century modern coffee table is what a small living room needs. It’s compact, convenient and versatile. The table has two spacious pocket drawers on either side and a shelf between them. You can store books and utility items in these broad and high drawers. The table’s design is minimal sans ornamentation and follows a curved structure. The chrome legs and a glossy lacquer finish of the table impart a modern vibe. Buy this Now. Set on top of slightly splayed legs, this coffee table is crafted from solid and manufactured wood and features two pullout drawers. The unique color of this coffee table can add character to any living room. Buy this Now. This mid century modern coffee table is boxy in silhouette. Under the tabletop, one side of it is an open shelf, and the other is a closed drawer. This Oakwood coffee table is not just spacious in its function, but also visually appears to be so. Except for the drawer and the legs, it is painted in white color. This contrast of white and light brown of the wood creates an airy look. Place it on a single tone or a mid-century modern rug for added character. Buy this Now. With its iconic and timeless silhouette, this table can be a great addition to any living room. This minimalist coffee table features slightly dipped surface and classic walnut finish. This single tone table will go well with modern upholstery while lending a mid century vibe. Add a stack of design books and a chic statuette for an artful look, or top it with a vintage vase to play up its midcentury side. Buy This Now. 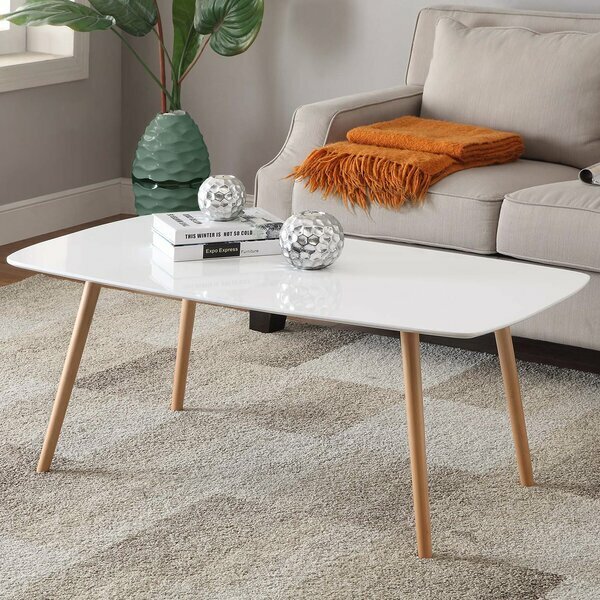 Give your living room a designer look with this classy mid century modern coffee table. It has an egg-shaped tabletop made of an ash colored wood. Standing on three angular hairpin legs in black iron it’ll add to the mid-century appeal. The smooth, clean lines of its top complement its three artistically positioned metal legs. 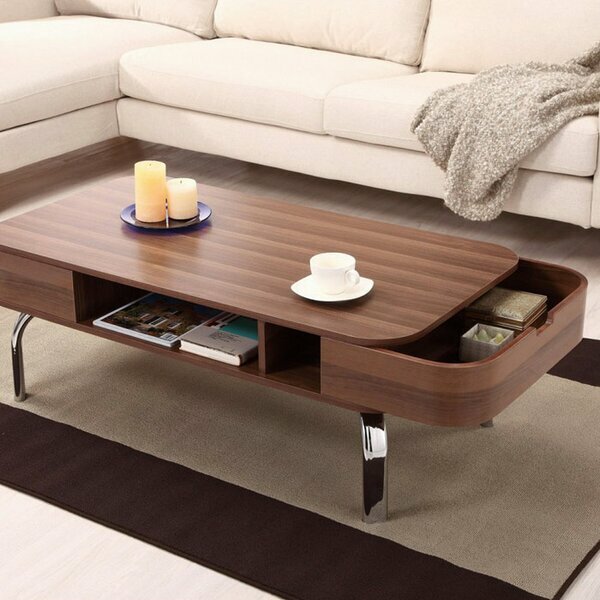 The design aesthetics of this coffee table are well suited for a contemporary setting as well. Buy This Now. The white tabletop of this coffee table is sleek and has a gleaming piano finish. The modern white rounded tabletop is contrasted with the long solid wooden legs. Minimalist and tiny, this can fit into any space and make that space look stylish. Buy this Now. Made from a deep walnut brown Rubberwood, this coffee table from Wayfair is charming. While the material and color used are traditional, the design of the coffee table is modern. Standing on three slanted legs, the tabletop has a curved top and a solid finish. The design aesthetics of this piece make it a versatile mid century modern coffee table. Place it on the patio, living room or your den, it will do the job of making your space look stylish. Buy this Now. This chic mid century modern coffee table owes the fun element to its unique design. The hairpin style legs in chrome finish complement the glossy white table top. 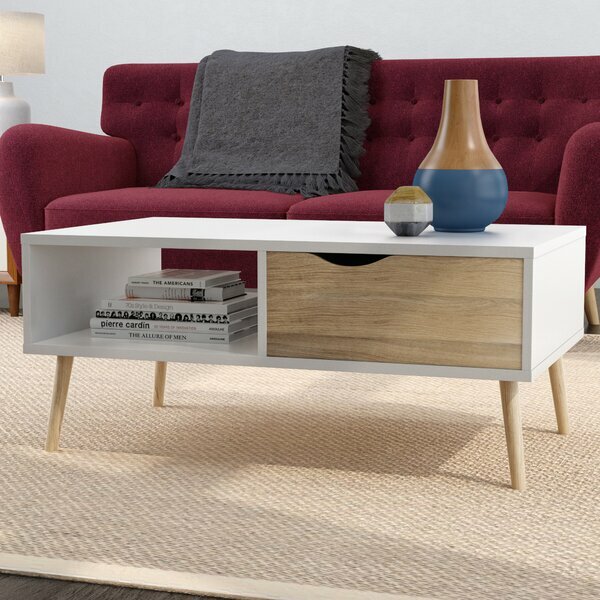 Featuring a chic lower shelf, this coffee table matches fashion with function. Buy this Now. This coffee table is a contemporary twist to the mid-century modern style. The clean-lined silhouette atop splayed legs lends the mid century vibe. The drop down side panels and the added glass make it an attention grabber. An open shelf below makes space to stage your favorite decorative pieces. Buy this Now.